I love musicals. I really do! So whenever there are musicals showing I make it a point to watch it. Today I went to watch “West Side Story”. I enjoyed the show and the set was amazing! :) After the musical mum took us shopping! So yey! I got myself a pair of red plaid pants & black star elastic waisted belt from Zara TRF. such a great elegant look! I love this much. i love the polka dot blazer. i was planning to get it too, but ran out of cash ;p but there was only in black n white over here, none in grey. sigh! ohhh i like your blazer! do we have a giordano concepts store here in manila? Fantastic blazer! I assume it's from HK? I haven't seen a Giordano concepts store in Manila yet. Mrs. C: nope. We do not have giordano concepts store in manila yet. M: you're right! 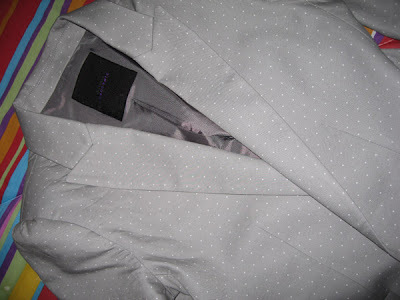 I got this blazer in Hong Kong.